The decision by parliament not to support immediate military action against Syria has led to much speculation about how this will affect the so-called “special relationship” we have with the US. Most of which is utter guff. The special relationship between the UK and the US isn’t based on politics. It’s based on history, culture and geography. The US was founded by settlers leaving England. 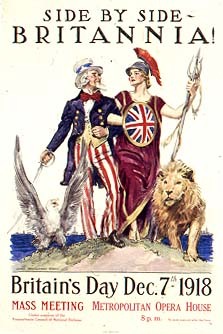 When the US fought for independence, it was the UK that they fought against. England gave the US its language, its legal system and its concepts of democracy. The UK’s history as a leading maritime nation also resulted in trans-Atlantic trade and communication links between the UK and the US that easily surpassed any links between the US and other European nations. The UK and the US between them are the world’s leading suppliers of popular culture: movies, music and TV. There are, quite simply, more common ties between the UK and the US than between either of them and any other country in the old or new world respectively. All of that is established fact. You can’t change history just by disagreeing about the present. So why should it matter that the UK has decided not to join the US in a military adventure? Did it damage the special relationship when the US initially stood back from getting involved in WWI? Or WWII? Or that the UK didn’t get involved in Vietnam? So why all the hand-wringing over the fact that, for once, the UK has decided not to do what the US wants? If some politicians (on both sides of the Atlantic) are under the impression that the special relationship means that when the US says “jump” we ask “how high?” then, frankly, the sooner they are disabused of that idiotic notion the better. The special relationship will be a whole lot more special without being used as an excuse for riding roughshod over democracy.